Twenty-three Volney Elementary School students were presented with an On-A-Roll Award at the school’s March character education assembly. On-A-Roll Awards are presented monthly at the school to recognize students that demonstrate a positive attitude and a marked improvement in their studies. 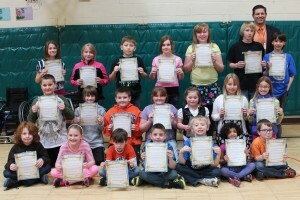 Volney Principal Jeff Hendrickson is pictured with On-A-Roll honorees: Jaxin Cates, Solange Catano-Matip, Gavynn Krick, Aidan Baldwin, Jacob Ingersoll, Tyler Goutermout-Reynolds, Addison Pickard, Elijah Turner, Naomi Roberts, Alexis Ingersoll, Kendall Williamson, Jeffrey Crockford, Brianna Murtaugh, Mitchell Donaldson, Nicholas Miceli, Jacob Curtis, Mackenzie Birdsell, Mandee Price, Nick Smith, Lily Hokanson, Owen Ayotte, and Chloe Davis. Unavailable at time of photo was On-A-Roll honoree Erin Babb.